The hike to Mt. 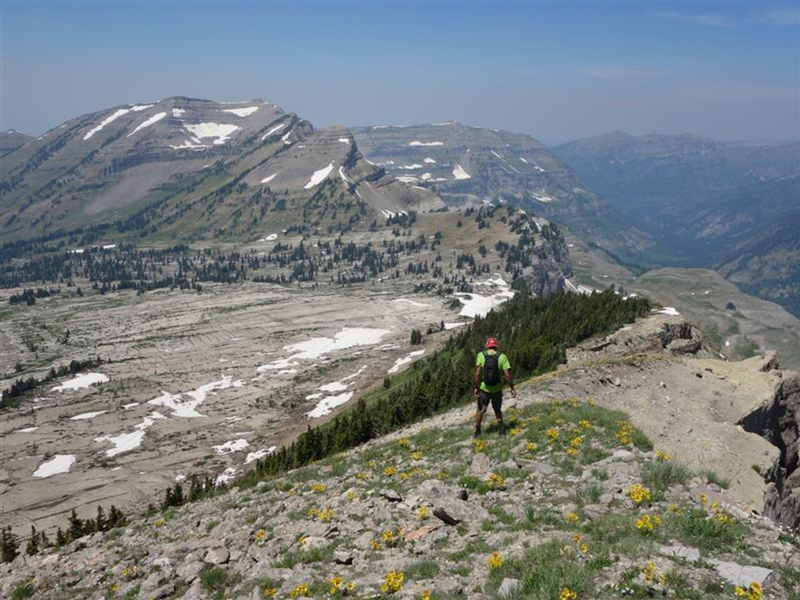 Meek is an unmaintained-but-well-worn trail to the summit of a Teton peak that isn't in Grand Teton National Park, which means you can bring your dog. Options for a little more or a little less. Water is plentiful along the route. 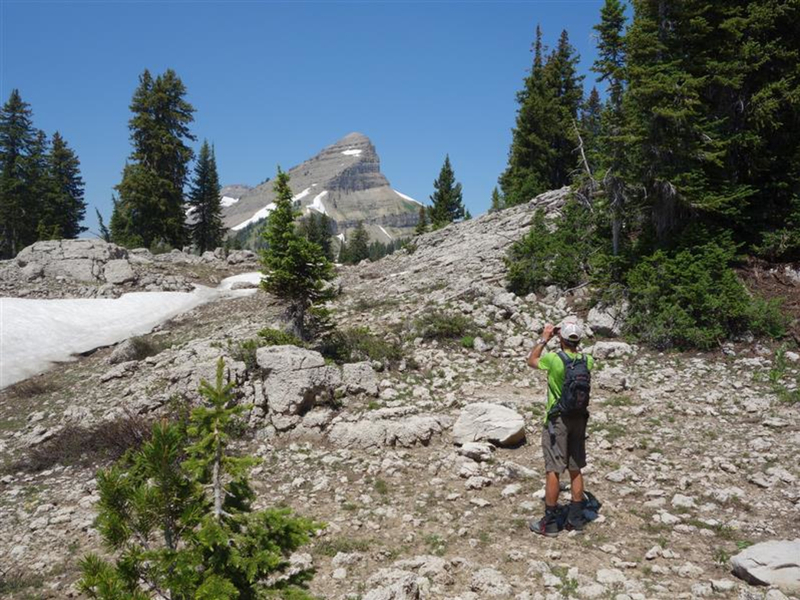 On maps, there's no trail up the North Fork of Darby Canyon, in the Targhee National Forest. In reality, there is. 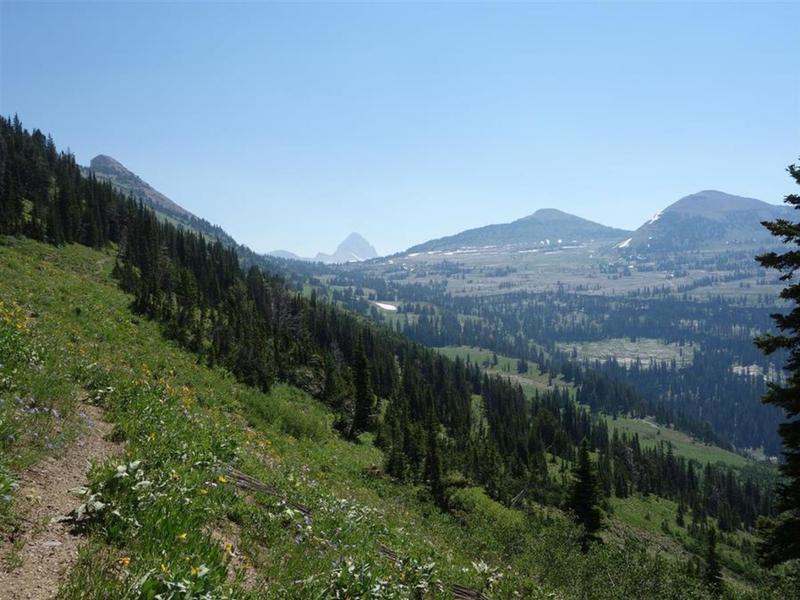 Because Darby Canyon is not in Grand Teton National Park, but in the Targhee National Forest, hunting is allowed there. We bet it was hunters that first beat this trail in. Yes, the first mile has about half-a-dozen downed trees you have to scramble over or bushwhack around. It gets much better as you get higher though. This trail first climbs gently, sidehilling across the northern side of the North Fork. You'll quickly have views out over the South Fork. A middle section switchbacks through trees and is steeper. 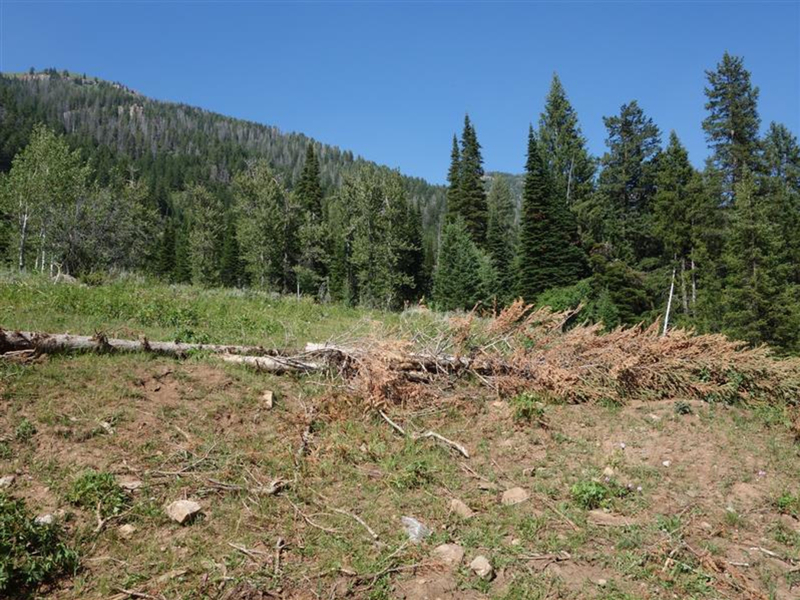 About 2,000 vertical feet and three miles above the parking lot, you come out of the forest and the trail flattens out. There's a big rock here perfect for a snack break. As tempting as it is, you will not want to make this your lunch spot. The vistas of Mt. Bannon and Fossil Mountain are impressive, but even better views (of the main Teton peaks) are about 1/5 miles in front of you. From this point you can also look down on the Middle Fork of Darby Canyon. The trail sidehills for a bit and then drops down about 300 feet to the big open expanse that each of the three forks of Darby Canyon have at their heads. There are streams through here you can filter water from that last most of every summer. The trail eventually ends at what I've only heard called "The Lookout." It's 4.8 miles and 2,800 feet from the new parking lot. The Southe Fork of Teton Canyon is several hundred feet directly below. You can wave at people hiking up that canyon, but don't try to get down there. The north side of Mt. Meek is tremendously steep. Where it's not tremendously steep, it's merely substantially steep. All of it is also fairly loose. The Lookout is a perfectly fine turn around point. But, the 10,607-foot summit of Mt. Meek is only about 1 mile further. If you follow the ridge from The Lookout directly, expect a bit of bushwhacking through low-but-dense pine at the bottom. You can walk around to the south in a meadowy area to avoid this. Just make sure to cut back to the ridge as soon as you can. You can sidehill across the meadow area all the way to the top, but it becomes quite treacherous--loose and steep--the higher you go. The ridge has some exposure, but travel is generally easy. 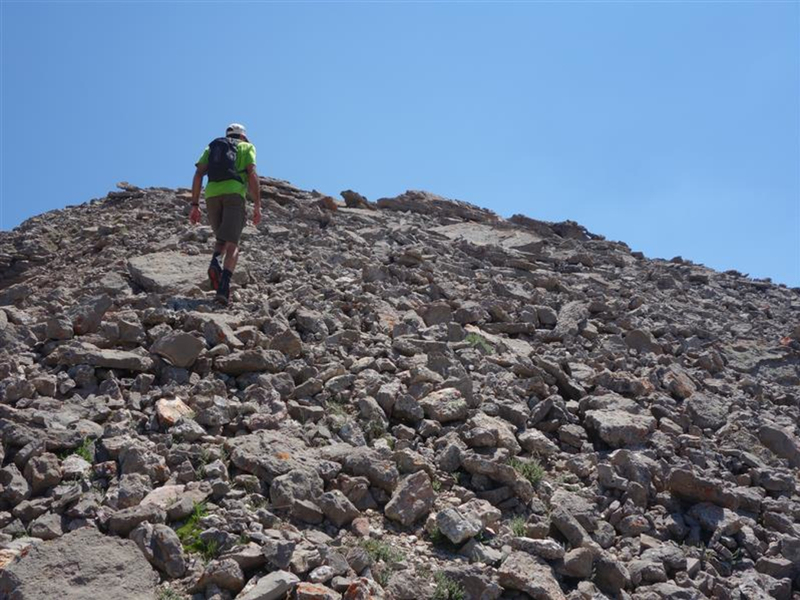 It is hiking, not scrambling. 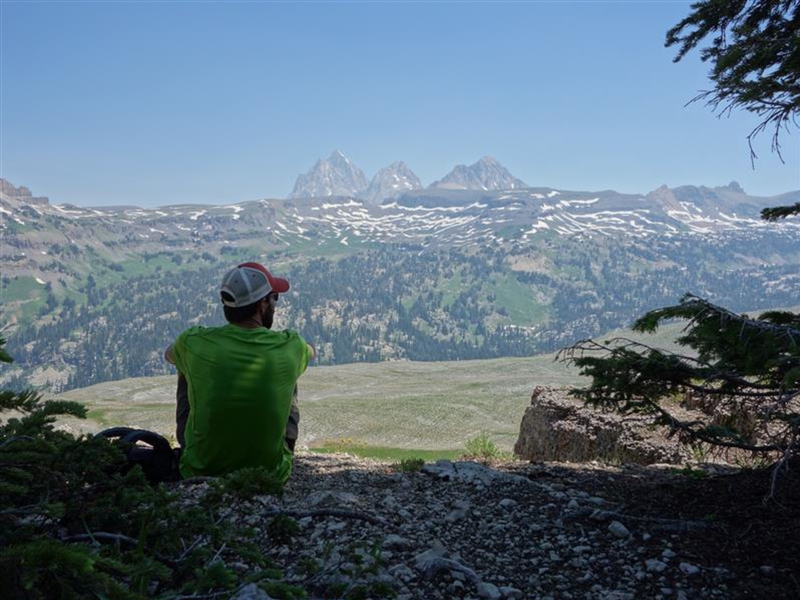 Hikers looking for a moderate, wildflower-ful hike to a spot with beautiful vistas of the backside of the Tetons. Head north from Victor on ID-33. Take a right onto E3000S. There are signs at the highway indicating Darby Canyon is in this direction. The road stays paved for a couple of miles and then turns into dirt. Soon after, it comes to a T. Turn right at the T. The trailhead is about six miles up this road. The trailhead was recently moved about 1/4-mile west. A new trail was constructed from the new trailhead to the old trailhead, where both the main (heavily trafficked) trail to the South Fork of Darby and the Ice and Wind Caves and the unofficial trail up the North Fork start. The last photo in the photos above show where this trail starts as of July 2014. There is a downed pine tree at the east end of the lot. A faint, old double track lays behind it. The doubletrack turns into a single track trail--the trail up the North Fork--in 40-50 feet. So, You Want To Go To Phelps Lake?